Hugh Blacklock was undoubtedly the best high school running back ever to play tackle for the Decatur Staleys and Chicago Bears. As he started his collegiate career in 1913 at the Michigan Agricultural College [now Michigan State University] his prep coach told the Detroit Free Press that Blacklock was: “The greatest football player ever developed in a western Michigan high school,” and that his freshman college exploits were “the result of a strong physique, real courage and tireless effort.” It was legend that Blacklock played both offense and defense every minute of every varsity game his freshman year in college. Lettering for the “Aggies” in 1913, 1914, and 1915, he finished as an All-American lineman in 1916. Blacklock was working in Grand Rapids as a chauffeur when he entered the U.S. Navy on September 2, 1917 and was assigned to the Great Lakes Training Station near Waukegan, Illinois. It was there that he met and played football with George Halas. While on leave, he returned home briefly and married Bessie M. Skeels on December 6, 1917, before returning to base and touring with the navy ice hockey team. After his “Blue Jackets” won the 1919 Rose Bowl he again returned to Grand Rapids [“Furniture City USA”] and began work as an upholsterer in one of the many local factories to support his wife and infant daughter. In order to earn some extra cash, he again joined George Halas on Sundays that fall playing football for the Hammond Pros of Indiana. When Halas needed someone to anchor the Starchmen line in 1920 Blacklock came to Decatur and started every Staley game at left tackle that year and again during the 1921 season. 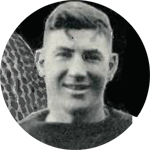 He then played the following four seasons for the Chicago Bears before finishing his pro career with the NFL’s Brooklyn Lions in 1926. When not playing football, he worked in Grand Rapids as a truck driver and then as a deputy sheriff. From 1928 through 1934 he worked as captain of the guards at the Grand Rapids National Bank before being elected Sheriff of Kent County, Michigan. Blacklock was very active in state and national sheriff’s associations in the 1940s and was credited with modernizing and enlarging the department and working for a new county jail. When George Halas started having annual player reunions in Chicago in 1937, Hugh usually attended. However, he never got to the large “Staley Day” celebration in 1956 as Sheriff Blacklock died of cancer on May 21, 1954 and was buried at Fairplains Cemetery in Grand Rapids. In 1972 this local hero was inducted into the Grand Rapids Sports Hall of Fame.